Here’s a bit of trivia for you: Who is the English language author who has sold more books than any other? I ran across this question earlier this year while participating in a trivia fundraiser event for the Indiana Bar Foundation (no, I’m not a lawyer but, God help me, I have several friends that are 🙂 ). 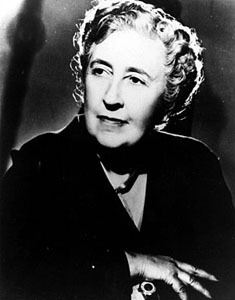 I and my team failed to come up with the answer they were looking for, which turns out to be… Agatha Christie. So, do you believe in precognition or premonitions? I don’t. Not really, anyway. The funny thing is, that for those who have a ‘random’ or coincidental dream or premonition that actually does come true, it is understandably hard to convince them that their experience was not “supernatural” in any way. 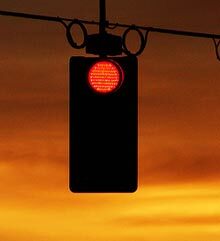 “The Red Signal,” touches on this theme in a tidy succinct way. We join the action at a dinner party at the home of Jack and Claire Trent, where one of the guests is the famous alienist (I’ve always loved that word), Sir Alington. Another guest, Dermot West, is also the nephew of Sir Alington, and in love with Claire Trent, the wife of a good friend. The beauty of this story’s construction, though, is that Christie somehow weaves the tale so that the “don’t go home” warning could actually be applied to almost any of them. It’s not a long story, and is more of a crime story than a pure mystery. I recommend it. I adore Agatha Christie. I’ve read most of her novels, but I haven’t read this story before. I like that her stories are cozy reads, but they still make you think. I recently had the chance to see The Mousetrap in London (the longest-running play in the world!) and it was wonderful. I can understand why she’s such as popular author. I like Christie’s style as well. There’s a certain “tidiness” about her stories. I love Christie’s short stories. I remember 2 of her stories that are actually supernatural; The Dressmaker’s Doll and In a Glass Darkly. Have u read them? I have NOT read those two, but I enjoy a good supernatural story as much as the next guy. I will have to look into them. I haven’t read this one, but it sounds good. Christie had fun with psychics and mediums in her stories. If you’re interested in a good collection of short tales by Christie try The Thirteen Problems (also has the title The Tuesday Club Murders). A group of people get together and each one tells the others a mystery they’ve come across in real life, while the others have to guess the solution. Miss Marple is always a member of the circle, and of course she gets it every time, to people’s astonishment (after all, what would a gentle spinster from a small village know about life, they think). Thanks for the recommendation. I will probably buy/download that collection, as I am looking to populate my 52 (scheduled) stories to read next year. The vehicle used (of having the club puzzle over the mysteries) reminds me of when I read Isaac Asimov’s autobiography earlier this year, and he had a series of mystery books/stories in a similar theme, but I think it was the waiter at the club who always provided the solution. The name of the series escapes me, but I will look it up and edit this reply later. I didn’t know she wrote anything “supernatural” either, but I plan to follow up and read the stories that Che recommends above.